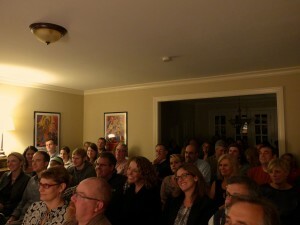 We host both public listening rooms and, occasionally, private house concerts. Here’s how to know which kind of event you’re attending and what to expect. 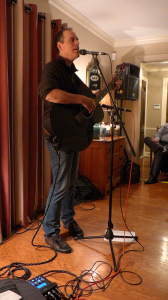 A house concert is a privately hosted musical performance in or around a home as opposed to a public venue (like a bar or coffeehouse), which gives you a give a chance to see performers in a more casual, intimate setting. SO WHAT’S A LISTENING ROOM? Basically the same concept as a house concert, but in a public venue. For our shows, we move around to different interesting locations in Memphis. If the location isn’t posted when the show is announced, it will be made public at least 30 days before the concert. For house concerts, you don’t. Each show has a suggested minimum donation, however, and 100% of donations for a show go to the artist performing. House concerts are private events, which means attendance is by invitation only, but if you got this far and want to be invited, we want you to join us! Submit your email address over there on the right and you’ll hear about all our events. When you want to attend a house show, just RSVP. The address of a house show is never posted to the public; only confirmed guests actually know where we’ll be. If you’ve been confirmed as a guest and are moved to donate to the artist before the event, you’re more than welcome to do so. For listening rooms, a ticket link is posted for every concert, so just go on and buy one. Whether you buy a ticket or make a freewill donation, we are unable to offer refunds unless a show is cancelled. HOW BIG ARE THESE SHOWS? Depending on the available space and the comfort level of the host, concerts range quite a bit in size and scope. It may be 20 people in a living room or 100 people in a backyard. We tend to have between 30-60 people and choose the location based partially on the expected draw so we can provide a great experience (and view) for everyone. Because of the limited capacity, these concerts require a very good idea of how many people are coming so as not to over-stuff the performance space or turn people away. If we’re at capacity for an event, we’ll start a waiting list. Intimate shows like this tend to make strangers into friends pretty quickly, if you’re into that kind of thing. For house shows, we provide drinks and snacks and time to mingle. For listening rooms, you can BYOB (responsibly and respectfully). The show will begin 30 minutes after doors open, and we’d like to keep interruptions to an absolute minimum. All seats are general admission and first-come, first-served (unless you’re a patron who reserved a seat for a particular performance). This is where it really gets good. Settle in and enjoy a concert experience that prioritizes your enjoyment and the artist’s talent. Attention and respect for the performer and fellow guests are expected. Phones are put away, chatter is limited, and we all leave appreciating the amazing artist connection created when everyone listens together. Schedule permitting, we’ll hang out for a little while after the show, usually with the performers joining the conversation as well. Artists may also bring merchandise (CDs, shirts, etc) for sale if you want to take away a memory of the evening and further support the artists. IS THERE SOME WAY I CAN HELP WITH THE SHOW? Sometimes we’ll ask for volunteers to help sell merchandise or other set-up needs, so just let us know if you’re interested in lending a hand. And there’s no harm in guests pitching in for the party – if you would like to make a donation to support Folk All Y’all in hosting these great events, you can make a one-time donation here or become a sustaining subscriber and get access to behind-the-scenes show stuff and swag. You can also just buy our shirts; all profits go to support our operations. WHAT IF I SAY I’M COMING BUT THEN I CAN’T? Tickets to listening rooms are non-refundable but can be transferred as needed. Whether or not an event is kid-friendly depends largely on the kid. If your child can sit quietly for two hours and enjoy the performance, they’re welcome. If you think s/he is and s/he turns out not to be, please have an escape plan.